Netflix announces more 4K HDR programmes | What Hi-Fi? Netflix is committing to 4K and HDR, promising more than 150 hours of 4K HDR content by the end of the year. Netflix was one of the first services to jump on the 4K bandwagon and now doing its best to press ahead with high dynamic range (HDR) - the latest hot topic when it comes to TV picture technology. 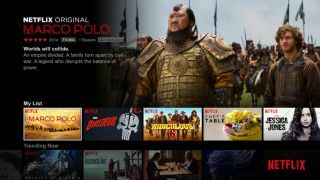 Marco Polo, a Netflix original show, became the first HDR series on Netflix, and now the company has announced plans to add around 100 hours of HDR content - 4K shows that also support HDR - by the end of August, and more than 150 hours by the end of the year. You'll need an HDR-compatible TV (or Dolby Vision TV) complete with the Netflix app in order to see the programmes in all their glory - most high-end 4K TVs being released in 2016 will support HDR, but not all have the necessary Netflix 4K app. The brand new Panasonic and Sony 4K TVs for 2016 do support Netflix 4K HDR content. You can also consult the list of Netflix recommended TVs for 2016. MORE: HDR - What is it? How can you watch it? The list of Netflix HDR shows released so far is as follows: A Series of Unfortunate Events, Bloodline, Chef’s Table, Hibana, Knights of Sidonia, Marco Polo, Marvel’s Daredevil, Marvel’s Iron Fist, Marvel’s Jessica Jones, Marvel’s Luke Cage, Marvel’s The Defenders, The Do-Over and The Ridiculous Six. Claiming that “pushing the boundaries on video quality” is one of the company’s passions, Netflix says HDR “looks great, and it will keep getting better”.